There has been a popular and persistent ask from customers to do more with the data that moves to the cloud via StorSimple. For example, use an Azure service such as Azure Media Services, Azure HDInsight, or Azure Machine Learning to process this data. To date, there was no scalable way to do this. That changes today! We are excited to announce the private preview of StorSimple Data Transformation- a managed service - that allows you to convert your data of interest from StorSimple format to Azure blobs. This in turn opens the data to the rich ecosystem of various Azure services. A call center customer uses StorSimple to store the audio recording of all calls. Using StorSimple Data Transformation, they are using Azure Media services to convert call to text, and analyze these calls for silence duration, sentiment and operator performance. 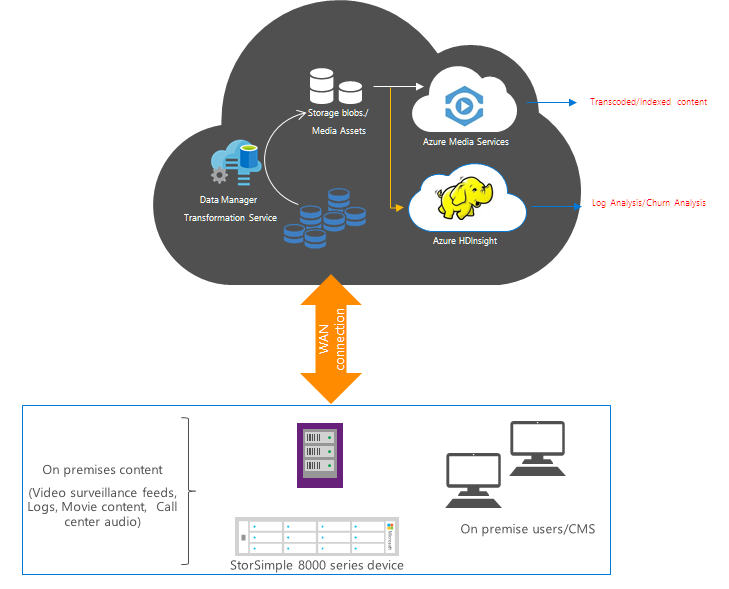 A customer who uses StorSimple for storing video surveillance feeds plans to use this service for face recognition and redaction using Azure Media services. If you are a StorSimple customer who wants to put their data to work in Azure, sign up for the preview. If you are a Media services or HDInsight customer looking to fulfil your on-premises storage needs while trying to use these solutions in Azure, enroll today!